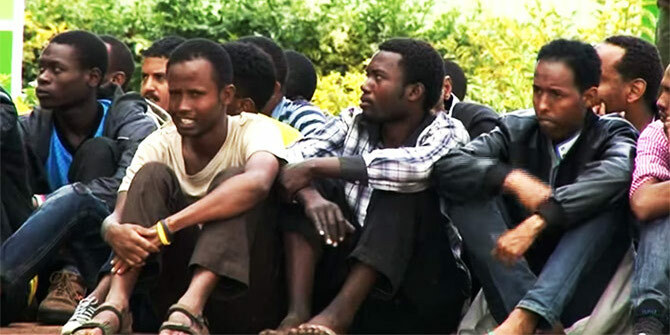 Following recent terrorist attacks, Kenyan police have rounded up thousands of Somali refugees. One video’s journey across Latin American protest movements underscores the challenge of monitoring and verifying activism online. While videos recent violence were the most dramatic we’ve seen from the Euromaidan protests, they are only the latest to document clashes in Kiev. In late January, several videos emerged exposing excess use of force by authorities. In 2013, the Human Rights Channel curated nearly 2300 videos from 100 countries. Collectively, they reveal not only *what* citizen journalists filmed this year, but *how* that video was seen and used. In the two and a half years Syria has been engulfed in war, numerous voices have tried to compel the world to take notice and take action. But the message that caught the world’s attention came not from any political leader or organization. It came by way of YouTube. A viral video from Russia makes inadvertent accomplices of viewers and LGBT activists. How can the online community expose abuse while avoiding further harm? With more witnesses from more regions equipped to document their communities, how can we in the human rights, media, and technology fields help realize the potential of citizen reporters? Twitter can be a rumor mill—or a newsroom. NPR’s Andy Carvin shares ideas for developing an informative and reliable online community for news gathering. A video grabs the world’s attention. It’s the type of video whose images have altered the discussion of the Syrian conflict, and may also revolutionize the role of citizen video in times of war.